Unfortunately, the city Tenochtitlan was destroyed by Cortes immediately after the Aztecs were conquered. Today, we find the location of the former central square of Tenochtitlan coincides perfectly with the location of the Zocalo in Mexico City. Buried under the pavement of the modern Zocalo lies a wealth of buried artifacts. Legend tells us that the first building constructed in Tenochtitlan was the temple honoring the Aztec god(H)Uitzilopochtli. We know that the Valley of Mexico was heavily populated at this time, and many of the surrounding towns had public buildings. Many of these buildings were temples. We also know that Tenochtitlan was well planned, and its aqueducts, roads, canals, and buildings were constructed by highly skilled masons. The Aztecs used limestone rocks and adobe bricks in their construction. Houses all had inner courtyards, they were painted white, and had flat thatched roofs. Only the nobility were allowed to have two stories. 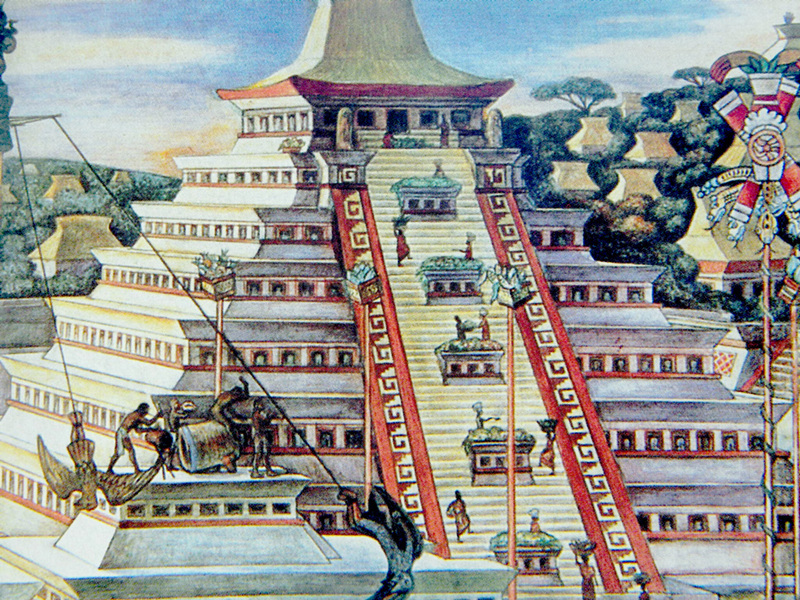 When Cortes and his men arrived in Tenochtitlan they stayed in palaces. They were magnificent, spacious, and well built of stone and cedar wood. The Aztecs used many sweet smelling woods in their construction. Cortes made note of the courtyards, with their awnings of woven cotton. The walls were shining with lime and decorated with all kinds of paintings and carved stone work. Cortes reported to King Charles that the pyramids of Tenochtitlan were higher than the cathedral in Spain, and that Montezuma lived in a palace, “so marvelous that it seems to me impossible to describe its excellence and grandeur...in Spain there is nothing to compare to it.” Montezuma's palace was indeed marvelous. It included a zoo filled with carnivorous animals, an aviary filled with exotic birds, an arsenal of weapons, a kitchen that could feed a thousand, a village for his entertainers, and hundreds of guest rooms for his chiefs, wives, and family. Most of the Aztec pyramids were constructed with very steep staircases. Temples were constructed on top of the pyramids. The Temple of Quetzalcoatl, with its entrance made to resemble a serpents mouth, was one of the Aztec's most impressive achievements.